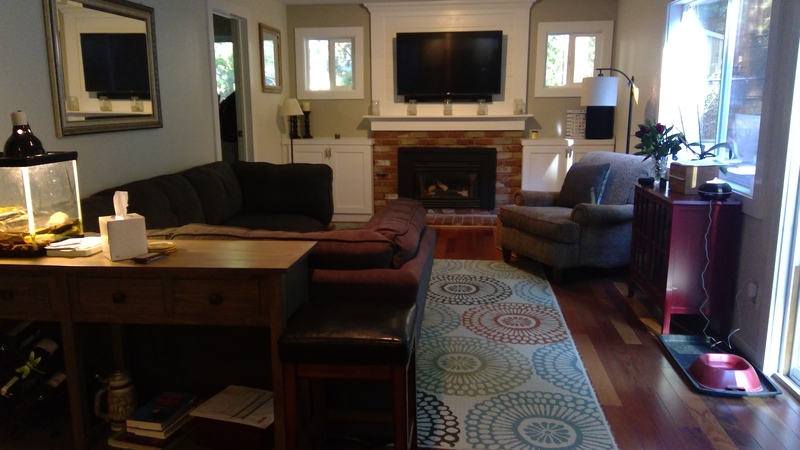 We immediately did an extensive remodel that added about 300 sf, took out walls, and added an upstairs porch. We repainted over the years, switched out furniture, and other small projects, but we realized we didn’t use the main family room barely at all. Originally, when we took out a wall between the kitchen and the family room, we thought we’d have that open concept everyone loved; except the family room was narrow and had doorways and fireplaces that screwed up the furniture placement. It wasn’t a comfy place to hang out until one day I realized I was running in and out of the living room where the tv is to watch a football game while cooking. “Hot hubby, I would really like a tv in the family room so I can cook and watch football.” Hot hubby’s face lit up, he likes a project. When he gets a project in his mind, I just say, “Ya, sounds great,” and let him at it. Oh my word, it was the best idea ever. Now this room is used constantly. It is possibly the favorite room in the house, and the living room is also still used a lot as well when people want to watch different shows, use the larger couch, or play the piano. “Why didn’t we do this ages ago? !” I love that our entire house is actually being used all of the time now.